Power is generated using a thermoelectric power generation unit. The thermoelectric power generation unit has at least one thermoelectric module disposed between a first heat sink arranged inside the thermoelectric power generation unit and a second heat sink arranged outside the thermoelectric power generation unit. The thermoelectric power generation unit is inserted into a ducting network carrying relatively hot air during some periods of time and relatively cold air during other periods of time so that the relatively hot and cold air flows through the thermoelectric power generation unit during the different periods of time. The thermoelectric power generation unit generates power when the ducting network carries either the relatively hot or cold air. Energy is stored at least partially based on the power generated by the thermoelectric power generation unit. 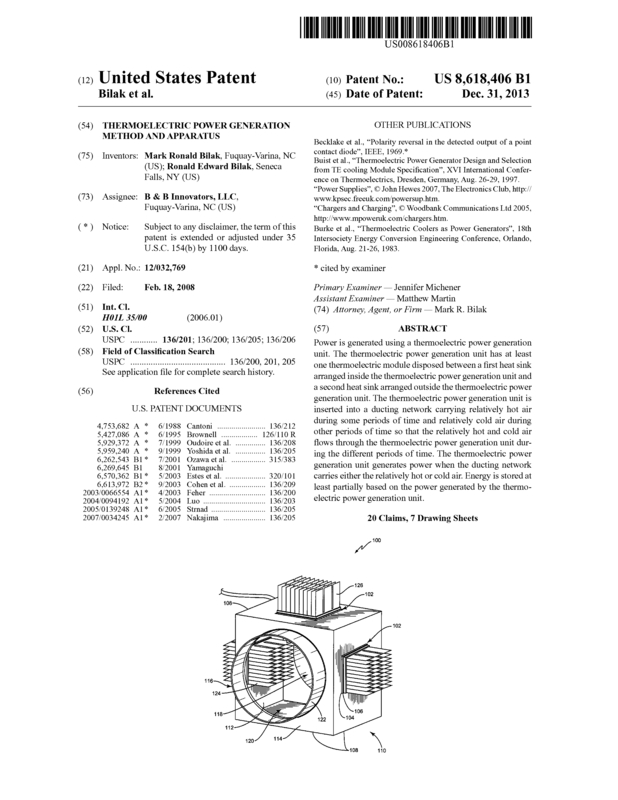 Page created at 2019-04-25 4:13:52, Patent Auction Time.